Introducing your one stop APP, the Parts Connection have an APP available from the Apple app store and also the Google play store. Just search for “Parts Connection NZ” and you’ll find our app. 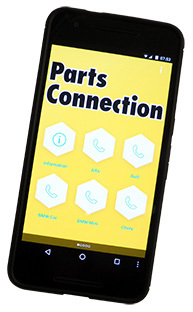 The app has instant free phone contact to every Parts Connection member as well as maps with driving instructions, it also has company search and a Facebook link. Download it today and you’ll never have any problems finding any part for just about any model car available in New Zealand. Please note that the app only works in New Zealand!